5.11 Tactical footwear is worn by police forces, EMS specialists, firefighting professionals, and tactical operators around the globe. From our hardened military boots to our covert and comfortable tactical shoes, our tactical boots & footwear give you the traction, agility, and resilience to maintain peak performance all day long. Our proprietary Shock Mitigation System makes our tactical and uniform boots highly mobile and surprisingly comfortable, increasing your focus and maximizing your ability to respond effectively. 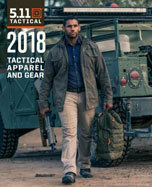 5.11 tactical boots are also ideally suited to hiking, hunting, and camping, and our low profile tactical footwear is perfect for both casual and CCW wear. Whatever the environment, and wherever your next mission takes you, 5.11 Tactical boots & footwear are engineered to give you lasting performance and utility without slowing you down.